With my dietary restrictions, this wonderfully fits the request for fall/winter weekend soup that feels like Potato Soup — without high carbohydrates (which mess up my blood sugar). Cook bacon and onion until completely glazed. Combine bacon, onion, chopped cauliflower, butter, garlic in stockpot. After blending broccoli and chicken stock, add those to stockpot also. Do not stir. Set to very low boil for 10 minutes. When cauliflower is done to your taste, stir in cream, cream cheese, and parmesan cheese. Add salt and pepper to taste. Cook for 3-5 minutes longer, stirring several times. Makes approximately 1/2 gallon (or eight 8-oz servings). * Admin issues: SHARE dementia awareness thru buttons below. Feel free to leave your thoughts in the form of comments, but please filter your comments with truthful loving kindness to all concerned. If interested in receiving notice of future blog postings, subscriptions are available through a “follow” button in the upper left corner (MS Explorer) or lower right (Safari, Mozilla Firefox and Chrome). If there is an advertisement below, I have no control over what is shown. Recipe revised from myketokitchen.com on 05 April 2019. 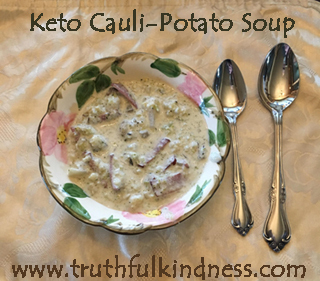 Tags are: keto, low-carb, soup, substitutes.